It’s just a simple bread, light and airy, a yummy olive oil saltiness and those fresh herbs bring the whole loaf to life. Use it as a side or to build delicious sandwiches! 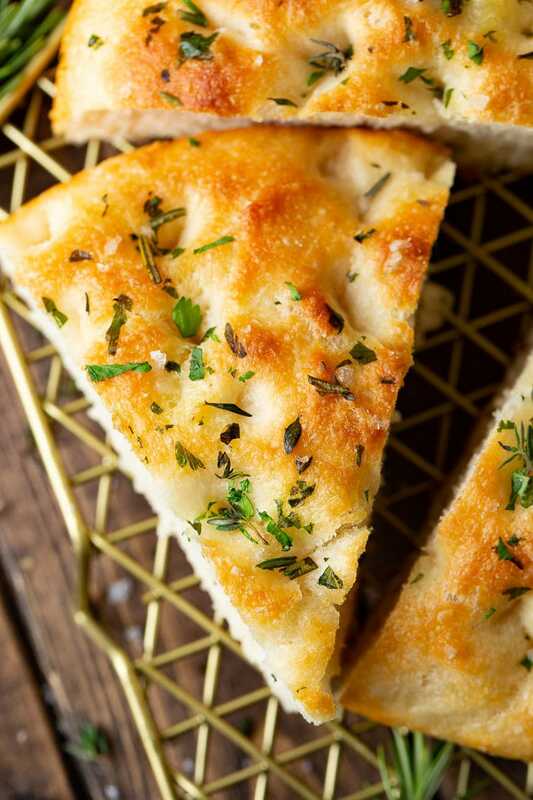 This is our recipe for the Easiest Herbed Focaccia Bread! We make bread a lot in this house because bread is pretty much heaven on earth if you ask me! Bread making takes some practice and making sandwich bread is a process to learn. If you want to learn to make bread, this is the easiest herbed focaccia bread and the best way to start learning about yeast bread. Now I should issue a warning right here from the get-go. This is not a bread you can whip up and have ready in a couple hours. The dough needs to rest in the refrigerator for at least 8 hours. I like to make it and let it sit overnight. 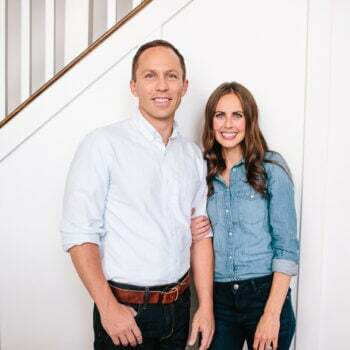 It is super simple, but it does take time and some planning. Oh baby is it worth the wait!! 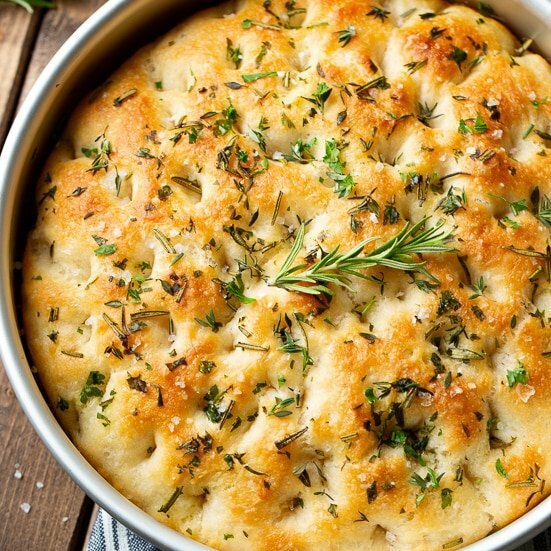 Focaccia bread is a flat oven-baked yeast bread that originates in Italy and is pronounced “fuh-KA-cha”. 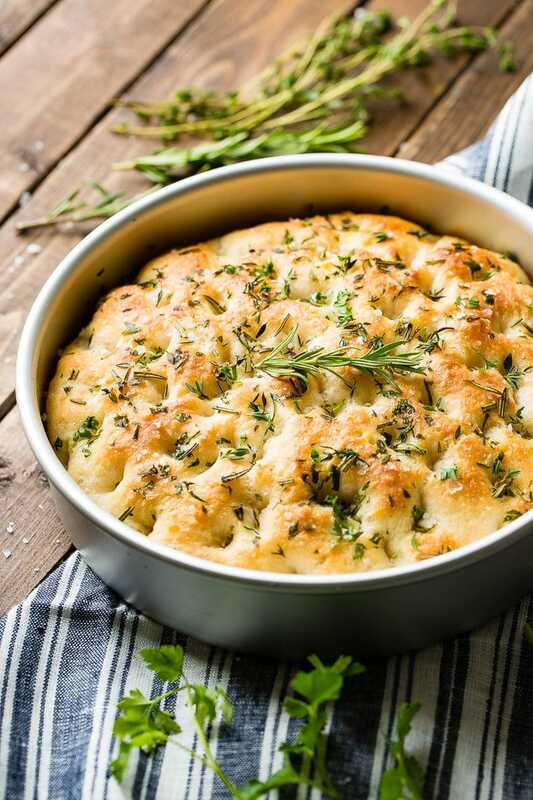 It is traditionally topped with fresh herbs, such as rosemary, and coarse salt, but it is a very versatile bread that can be altered to your liking. 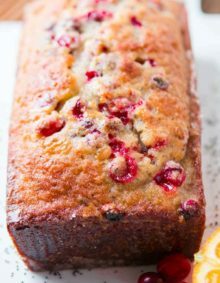 I’ve even seen it with raisins in it and topped with sugar or honey to make a sweet dessert bread. Yum! There are few specific instructions in this recipe that I want to explain briefly. First, we have the flour. 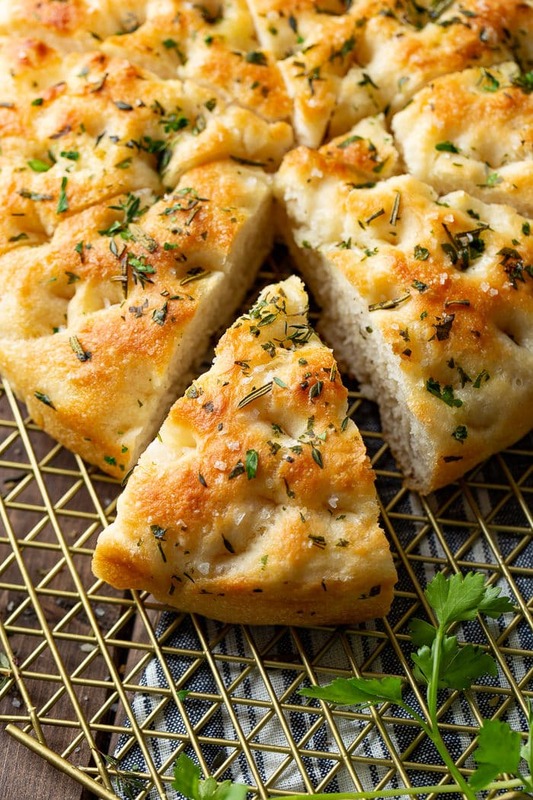 Focaccia bread should be made with a strong flour like bread flour because it is high in gluten. All purpose flour also does fine in this recipe if you don’t have bread flour. Second, I recommend using a glass bowl to mix the dough in. I’ve heard metal can change the taste, which I haven’t personally tested, but I really just like the way the dough comes together in a glass bowl. Last, the dough should be incorporated together using a wooden spoon. Wooden spoons incorporate better than spatulas. 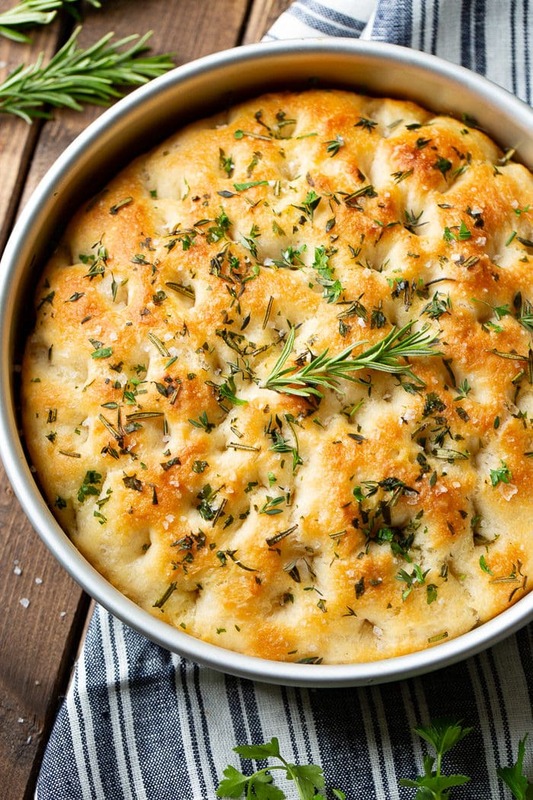 A signature of focaccia bread is the dimpling on the top, but is there a purpose or is it purely cosmetic? There are differing opinions out there, but the reason that makes the most sense to me is that it increases the surface area and creates little pockets for the olive oil to collect in. This enhances the flavor and crust of the bread. 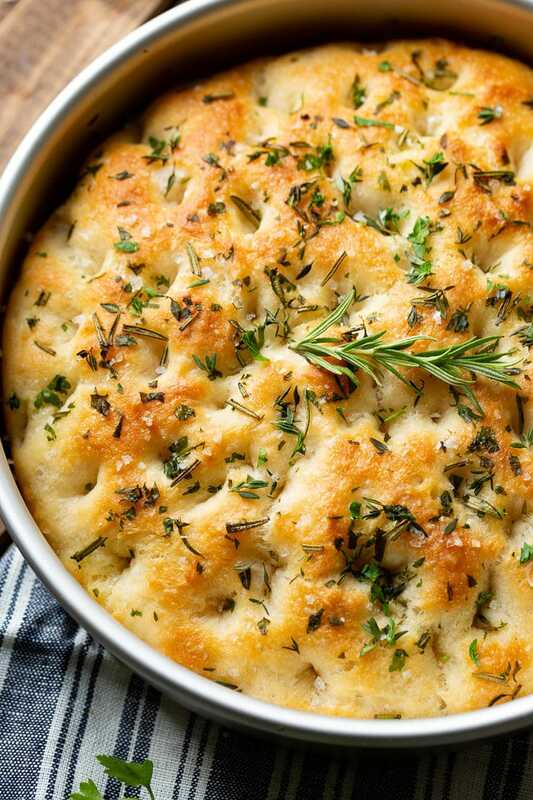 We rarely have any leftovers when we make this easy herbed focaccia bread. Our kids devour it! Occasionally, I’ll make two loaves just so we can have leftovers! Then I just store it on the counter in a ziplock bag. Because of the high olive oil content in the dough, it will last for a good 4-5 days at room temperature and still be delicious. If you want to freeze it, wrap it in plastic wrap and then store it in a ziplock bag or use a FoodSaver. It will last in the freezer for up to 3 months. Thaw it on the counter to room temperature before serving. It can also be warmed up on the oven. I love it warm!! Whether you are a seasoned baker or just getting your feet wet in the baking world, this recipe is for you! It is fool proof and even if this is your first time making a yeast bread, it’s going to come out gorgeous and perfect! 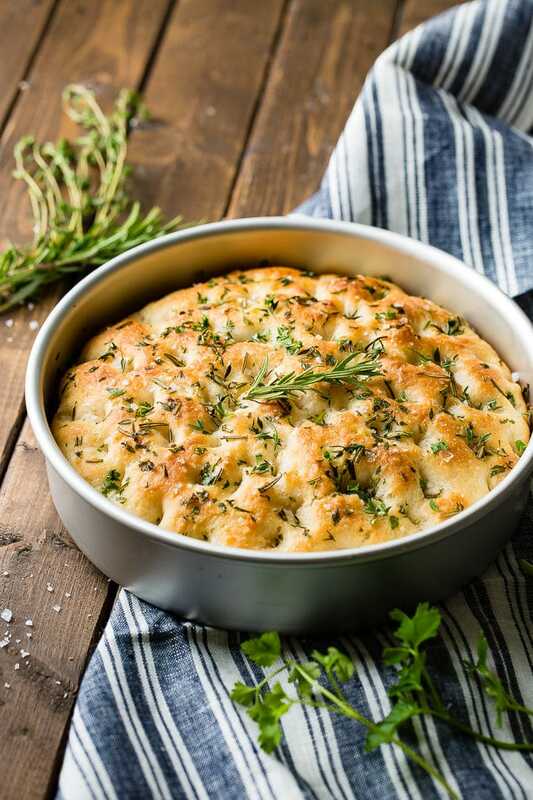 a light and airy herbed focaccia bread that's perfect alongside Italian dishes, grilled meats or for sandwiches! In a glass bowl, add the flour and salt. Mix to combine. In a glass measuring cup, mix the warm water, yeast and sugar. Allow to sit for a minute (see note) and stir into the flour with a wooden spoon until the dough just comes together. Cover the bowl with tight saran wrap and place in the fridge for 8 hours or up to over night. In an 8" round cake pan, drizzle oil oil and place the dough in the center, tucking ends under. Cover with plastic wrap and allow to rise 2 hours. Once risen the dough should fill the pan. Drizzle with additional oil and use your fingers to press holes down to the bottom of the pan but not through the dough. Sprinkle with herbs and salt. Place in the oven and turn down to 425 and bake 22-24 minutes or until golden. Looking for more delicious and easy bread recipes? 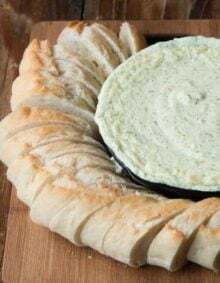 Try our Easy No Knead Artisan Bread, Bread Blossom, Easy Hoagie Rolls, Best Potato Rolls, One Hour Rolls, Easy Cheesy Ranch Rolls, or our Awesome Cheesy Herb Rolls. Has anyone had an issue with the dried herbs burning in the oven while baking? Just curious! Thanks all! We haven’t every had an issue with that. It shouldn’t be an issue with the short bake time. I have made this bread two days in a row! It is that good and very easy to make. Thank you for the yummy recipe! Love love love hearing this Nicole! Thank you! Giiiiiirrrrllll…I’m all about the dip too! I’ve never really measured amounts, but just mix some olive oil with some balsamic vinegar. Add a little salt and peppers and a little rosemary and you’ll be all set! Is it supposed to be 2 cups and 2T water or 1 cup and 2T water? 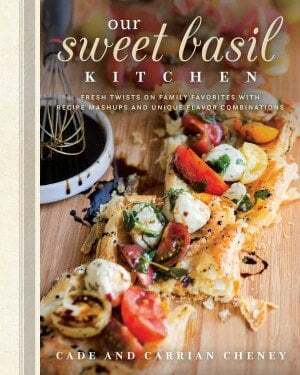 I’mmaking this right now. My dough seems more like soup. Is that right? Hey Kristina! I think I already responded to you on Facebook, but somehow that recipe got into our recipe plugin incorrectly. It should be 1 cup of water (no extra tablespoons) and 2 cups of flour. I’m so sorry about that! Sounds like an awesome dinner!! 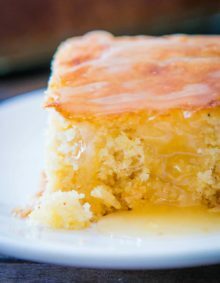 « Previous PostThe Very Best Banana Pudding Bundt Cake I’ve Ever Had!